Ann has been an artist for over 45years in different fields, painting, etching, ceramics, silver smithing but for the last 25 years she has been a full time artist here on Mt Glorious working in ceramics and silver. She majored in Art at Central QLD University in a teaching diploma, completed a 3 year certificate in ceramics at TAFE and studied painting with the Flying Art School for 10 years . Ann has been Involved in solo and group exhibitions yearly since 1989. She has also exhibited overseas in Italy and Norway. Her work is represented in the public collections of Moreton Bay Regional Council, Toowoomba Regional Gallery(Crows Nest), Central Queensland University, John Paul College and in private collections in Australia, New Zealand, England, France,Japan, Norway, Italy, USA. Over the years Ann has won many awards, eleven awards in the Moreton Bay Art Awards, John Paul College Ceramic Art Awards, Australian Craft Show Sculpture Award in Brisbane, Society of Sculptors Ceramic Sculpture Award, Crows Nest Regional Art Award for Sculpture, Goldsmiths' School Jewellery Design Award. www.oconnorstudio-art.com Facebook page. O'Connor Studio . Garry is a wildlife artist working in graphite, a medium which leans toward fine detail, and occasionally charcoal. The work generally starts from life observations and photo references, and together with a bit of imagination they can take many, many hours to complete. He is also a fine wood artist working primarily in recycled timbers. His woodwork and drawings are wholly inspired by our unique Australian fauna. It is through these photorealistic drawings and marquetry pieces that he is striving to heighten awareness of these wonderful creatures. 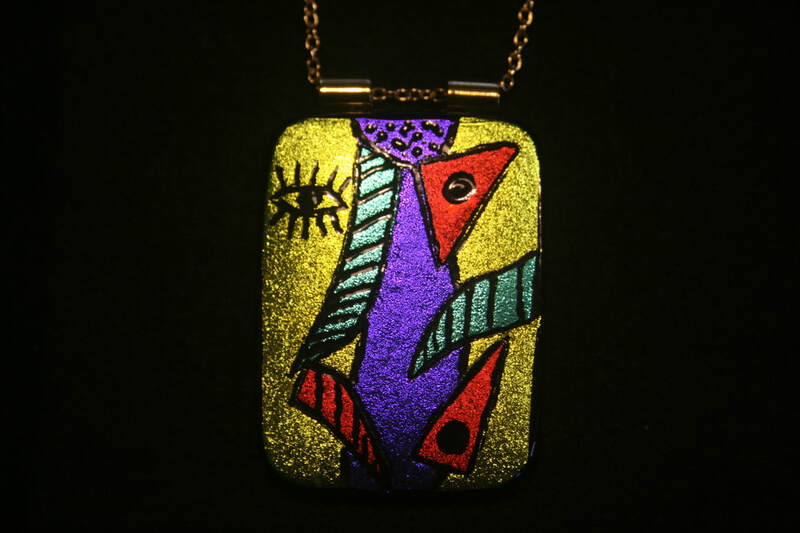 Deidre has taken several courses in glass fusing and slumping and dichroic jewellery making including two webinars with international glass artists Tanya Veit and Randy Wardell. These have inspired her to experiment with many different techniques. Her work is displayed in the Slab Hut Samford, the Pine Rivers Gallery, the Redcliffe Art Gallery, the Caboolture Hub and the Old Fire Station Gallery. 2010 The “Glorious Creators” Exhibition. 2013 Signatures Fine Art Exhibition. 2014 Signatures Fine Art Exhibition. 2015 Signatures Fine Art Exhibition. Anna studied visual arts at Queensland University of Technology, the University of Southern Queensland, and Deakin University. She has worked as a lecturer in Visual Arts, and as an artist on Community Arts projects. Anna works in watercolour and mixed media, and has exhibited sculptural installations, photographs, large drawings and prints, mixed media/collages, works in paper and woven tapestries. She has been exhibiting her artwork since 1982, and has had both solo and collaborative exhibitions in public and private galleries in Brisbane and across Southern Queensland, and has been included in nationally touring exhibitions. Her writings have been published in visual arts magazines. Robyn's art reflects her desire for simplicity and she is constantly seeking ways to bring this to the viewer’s eye, even if the actual artistic process is often far more complicated. She is currently working primarily in watercolour, pencil ink and acrylics. Robyn keeps her artist skills up to date by undertaking biannual workshops at Charles Sturt University NSW, with world renowned artists such as Joseph Zbukvic, David Taylor and Cherry Hood, and Linda Weil. She also attends many Brisbane-based workshops to increase her proficiency within various media. Her work has been recently exhibited at the Percolator Gallery in Paddington, and has been shown in both private and public spaces throughout Brisbane, Moreton Bay, and South Burnett Regions. 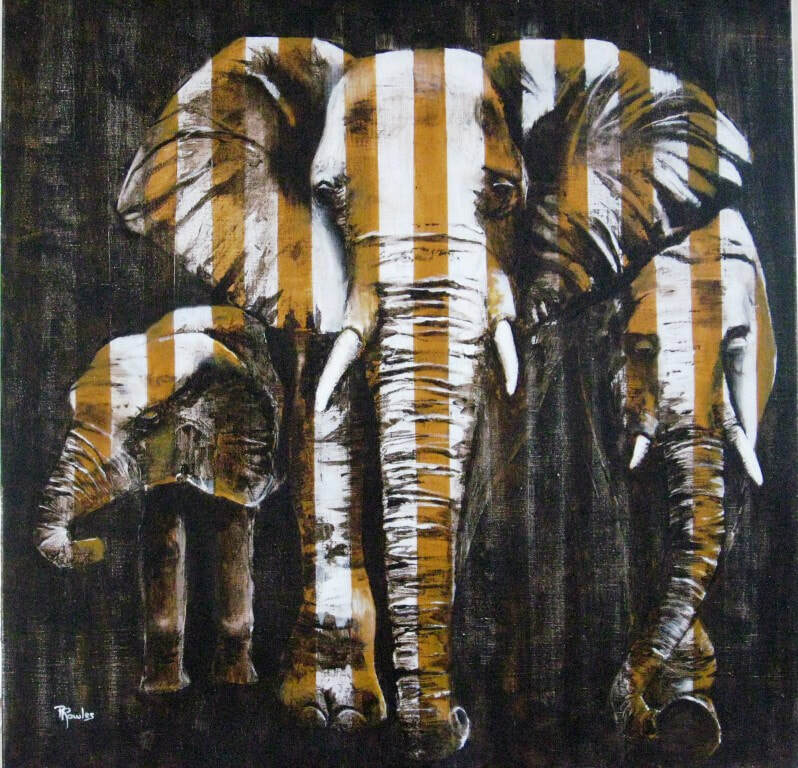 Bethany is a self-taught hobby artist working primarily with acrylics in contemporary styles. Experimenting with colours and patterns, She is inspired by nature, interpreting flora and fauna into vibrant and engaging artworks. Her exhibitions include Royal Queensland Art Society, Brisbane and Radford Art Show, Canberra. Karen has always been passionate about photography,. Having travelled widely, from the Antarctic to the Arctic, she takes inspiration from the breathtaking beauty of the natural world that surrounds us. She is particularly intrigued by details, texture and movement, which she explores with macro and abstract photography. Karen has regularly been invited to give presentations of photographs taken during her travels. She won first place in the Nobivac Human-Animal Bond photo competition in 2013, and was a finalist in the World Parks Congress ‘Saved’ Photography competition, held in Sydney to coincide with that international event in 2014. In March 2015 she joined The Slab Hut Gallery in Samford as a photographer, where she sells cards and photographs mounted for wall-hanging. The Mount Glorious and Mount Nebo Residents Association 2015 calendar contains many of her images. Her entries into the photography section of the Samford Show in 2015 received a number of first, second, and third placings, and she was awarded the Reserve Champion trophy. 2015 & 2016 Art with Altitude exhibition held at Mount Glorious Community Hall. Gerry has a three-year Tafe Certificate in Studio Ceramics, and has specialised in Raku pottery for more than 25 years. Since Raku became popular among Western potters sixty years ago its scope has been broadened to include sculpture and brilliant glaze colour. He has worked with several Melbourne potters who specialise in glaze and firing technology to solve colour problems in Raku glazes and to refine Raku firing techniques. For Gerry, Raku also has a deep philosophical base in Zen, which he finds compelling and which influences his work. Zen stresses spontaneity, simplicity and the aesthetics of irregularity and asymmetry as found in nature, as opposed to the aesthetics of balance and regularity as found in most western art. Western Raku is also influenced by Abstract Expressionism, which teaches that an artwork is the product of the individual, the process and the material, not just the product of the dominating will of the artist. Gerry has exhibited regularly in Australia since 1990, and his work was included in several shows in Italy in 1996. His Raku is in private collections in Australia and in many overseas countries. Gerry has written a play that has been performed professionally, and is also a photographer. Two of his photographic portrait exhibitions have been acquired by the Queensland State Library. Peter and Carol are a husband and wife team who work together as glass artists, collaborating on most of their work. They are members of the Royal Queensland Art Society an have attended many courses to further their techniques in glass work. They won first prize of Master Artisan for Traditional Stained Glass at the Medieval Masterpiece competition. They exhibit in mainly fund-raising shows around Brisbane and the Moreton Bay Region. Pat was educated at Coventry College of Art, England. He subsequently became an electronics engineer and came to Australia in 1969 to take up a position of lecturer at the Queensland Institute of Technology (now a university). After 23 years at the university, he decided to take early retirement to become a full time artist. His work has been on display in his studio at Mount Glorious (now closed). His work is varied and includes watercolours, acrylics, drawings and oil paintings. Pat has won many awards including Noosa, Caloundra, Pine Rivers, Crows Nest and has been a finalist at Stanthorpe on three occasions. The Ganis family - Venus and her daughters Ria and Cleo - are a family of ceramic artists working from their Mt Glorious studio. producing functional art, i.e. art with a use in daily living. As a collective,they have been inspired by the natural surroundings of Mt Glorious and have based their artworks on elements of nature. 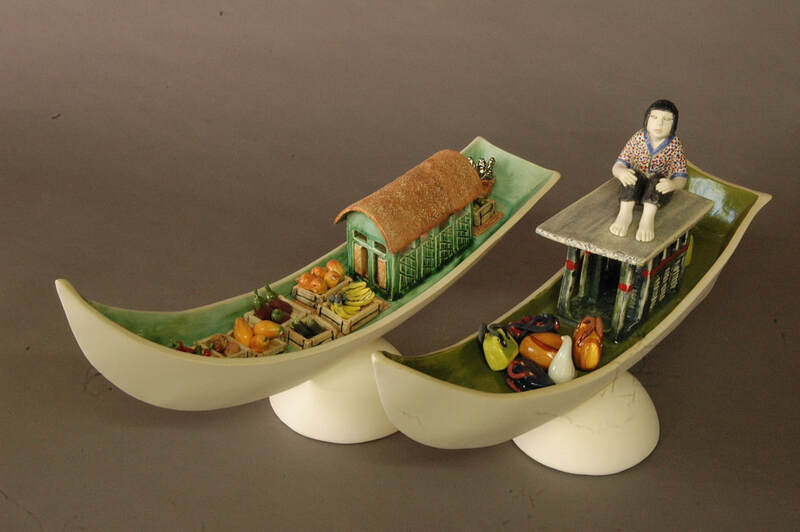 All their ceramic pieces have been hand made, hand pressed, and hand glazed. the under glaze and top glaze is lead-free and food-safe. Marie likes to be surrounded by vibrant colours and busy patterns. It makes her happy to see her world through a kaleidoscope of colour, shape and form. She is influenced by her early years rummaging through mountains of fabric, buttons, beads, braids and brown drafting paper. Marie followed in her father’s designer footsteps completing a Fashion Design course at Queensland College of Art and an Associate Diploma in Visual Arts which included Printmaking at Kelvin Grove College of Advanced Education. Her traditional and contemporary pieces are textile based, incorporating embroidery, applique, machine stitching and embellishments along with the occasional use of gouache, collected together like a curious and hoarding Bowerbird. She has exhibited in group shows and exhibitions in Brisbane, the UK, USA and Europe. She has also been recognized as a Winner in the QLD RAQ Fashion Awards in the Collections Category and National Winner VIP Fabric Quilt Block Challenge. throughout Regional Queensland and Australia. Vanessa has specialised in printmaking and painting with advanced studies in Etching and Monoprinting. In 2016 she expanded her range into ceramics to complement her acrylic art works. Barbara is currently working on combining abstract resin with silver in jewellery. She also does pencil sketches and glass light catchers enhanced with silver wire. Barbara describes herself as an amateur. She was part of the Mt Glorious artist exhibition at Strathpine a few years ago and has regularly hung oil paintings at Bribie Is Community Art Centre. Her photos have won competitions and she has had some photos and paintings selected for RNA. Wendy had studied at the Brisbane Institute of Art, Seven Hills College of Art, and the Creative Glass Guild. 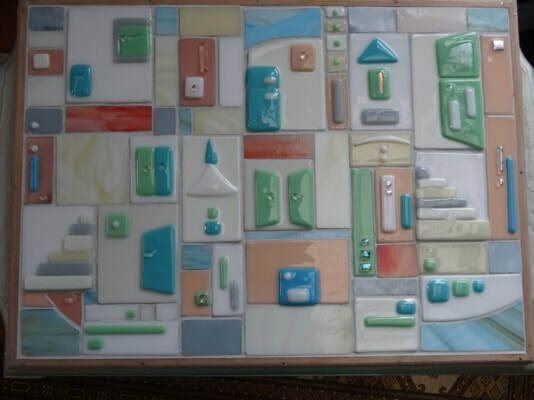 Her varied media include drawing and painting, ceramics, leadlighting, mosaic and sculpture. She has exhibited in the Pine Rivers region and has completed commissions for private homes. Robert spent six months at Queensland college of Art and is also qualified as a stonemason working in the restoration of stone buildings. His experience extends across a reasonably broad range of fields including pencil and ink drawing, painting, sculpture in stone, photography and digital art, print making and intermedia. Robert's primary interest is in ink drawing, in which he has some fifteen years of practice. During this time he has developed his own style which draws influence from geometry and botanical and biological drawing, tying the use of motifs and repetition of form to illustrate a cross section of consciousness at the time of creating. He sees the process of drawing as one of spontaneity, involving little or no premeditation and informed only by the previous iterations of the work. Scott was awarded a degree in Fine Arts from QUT in 1984. He worked throughout QLD as a high school art teacher from 1985 until 1995 after which he joined the QLD public service in Education until 2002. He now runs online retail stores and paints and sculpts part time. 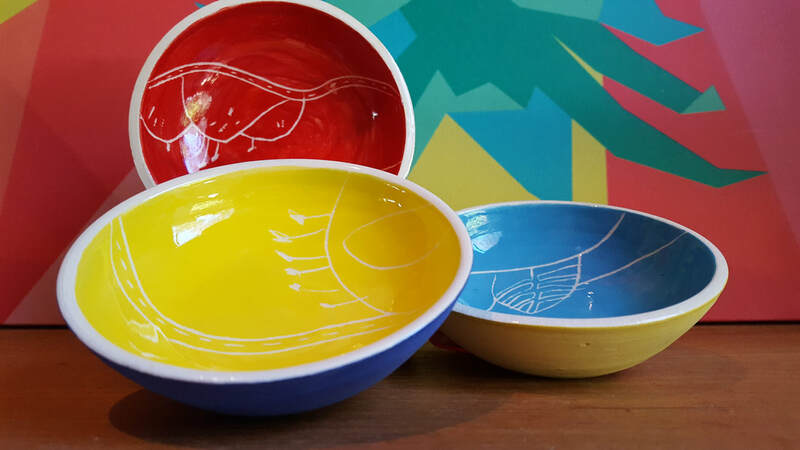 Scott specialised in ceramics from 1991 until 1995, when he painted abstract designs on tableware that he had thrown, and these were exhibited at the Fusions Gallery (Fortitude Valley) in 1992, and were sold through a few boutique homewares stores and at the Southbank Markets. Other than being included in two minor fine art exhibitions in the late 1980s, Scott has concentrated mainly on undertaking word-of-mouth commissioned works from time to time. His preference is now for abstract painting, drawing and sculpture. John works in acrylic and mixed media. He has explored both portraiture and landscape painting. His paintings for this year's exhibition reflect the ever-changing landscape of Mount Glorious. John has exhibited throughout the Moreton Bay region and extends his skills by attending masterclasses with established artists. Mary is an architect with an interest in graphics and design. She attended Seven hills College of Art.